A World In London 207 - Turns the heat up on new global albums! Turning the heat up on A World In London! Glowing global albums from Vietnam, Serbia, Iran, Italy, +++ previewed by DJ Ritu, Norman Druker, and Maisie Fitzmaurice. A World In London – in its TENTH year! 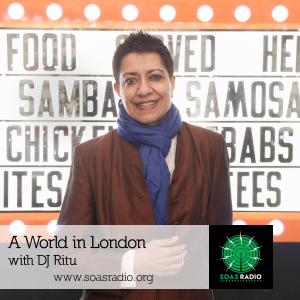 Live on Wednesdays, 4pm, from SOAS Radio: mixlr.com/soasradio and AWIL/CC at Resonance 104.4fm at 6.30pm, repeat Monday 8am, online, DAB & on Resonance Extra 5pm Wednesdays. Join us on Twitter @aworldinlondon This week Adesh Sundaresan at Resonance! #HappyChineseNewYear! London’s very best musicians make up the trio assigned to take you on a beautiful Aegean journey via your ears.... Read more..
We love exclusives at AWIL especially when they’re as excellent as Fiona Fey’s forthcoming CD, Naïve Wisdom.... Read more..
Last November a concert took place at The Barbican which EVERYBODY wanted to go to. Windrush: A Celebration, was... Read more..